Well, that question is not an easy one to answer although those of you who follow my blog daily will know about Star. She died peacefully in our arms exactly two weeks ago, no longer in pain, and waiting for me in garden in the sky somewhere. For a few days since I couldn’t write anything, nor do anything to speak of, not even publish a blog as my heart has been broken with grief over the loss of my cat and friend. I know others will relate to this; she was so much more than just a cat, she was a part of our family, in the very same way our children are. As Austin Powers would say, I lost my mojo! In some ways, the loss of this type of friend is more difficult due to the fact you spend so much time with them, their love is so unconditional, and you virtually never have a cross word. Maybe not everyone spends a lot of time with their family pets, but I most definitely have in the years since I’ve been grounded from driving, and she was my day and night time company through all my surgeries and illnesses, there every day when others could not be, simply because of school or work, or their own equally important commitments. Also this year, I’ve been to various corners of the country and world, travelling on and off, but seemingly constantly since the beginning of April. Some days I have wondered where I am, and where I’ve been. And also, where I’m going!! My BUB has not always been with me, and I have had to rely on others to support me. Thankfully I have a terrific network of other BUBs, available to assist, most of them having lived with someone with dementia, and so they see between the gaps where others don’t. However, from now on, my dear husband will travel with me as it is getting harder to manage. I’ve had a visit from a friend this week whose marriage has broken up, and she has to face re-creating her world almost from scratch, with limited resources and the challenges of finding employment over the age of 65. She has bravely decided to head to Sri Lanka to volunteer for six months, teaching English to Buddhist monks. I suspect the experience will fill her heart and soul with a new sense of peace, and freedom. Freedom from the expectations of others, and herself. We talked about the Universe supporting her, and both firmly believe it will. 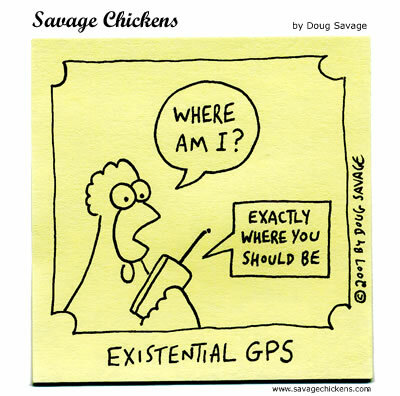 As the chicken’s walkie-talkie friend says, we are exactly where we should be! September 27, 2013 in Daily Blog. Tags: Author: Kate Swaffer © 2013, I lost my mojo, Where am I, Where am I going?, where have I been? we are exactly where we should be! We don’t always understand why, but I suppose it always works out. I know what you mean Tersia, it does always seem to work out, even when often it seems like it won’t ever! I’m so sorry for your loss. I truly understand. I didn’t have kids–my dogs were my kids. I was physically ill for a month when I lost my shadow. I will be completely devastated when the time comes for my sweet Dulcinea. Oh yeah I forgot….My email issue is fixed again and so I now get your posts again…Yea!!!! Yes, I saw that… welcome back FT!